My interpretation of the action and of the application of the Obstruction Rule, is very different from that of the coach commentator, who clearly saw both ball shielding and impeding (with backing in) by the ENG player, but did not consider any of these actions to be an obstruction offence. Had the USA player pushed the ball between the legs of the ENG player and then run into her that could have to be construed as an attempt to ‘manufacture’ an obstruction offence (A Forcing offence now dealt with under the Rules relating to physical contact). But that is not what happened. After the ball had been pushed between her feet. the ENG player, instead of pivoting clockwise off her left foot so that she could chase after the ball without impeding the USA player deliberately turned (moved) the opposite way to impose her body between the USA player and the ball and block her, when but for that action the USA player could have followed and played at the ball and would probably have regained possession of it. That was an obstruction offence by the ENG player. When an opponent pushes the ball through the legs of a player with the intention of running past them and collecting it on the far side there is no obligation for the defending player to move out of the path of the attacker if the attacker attempts to run ‘through’ them. But deliberately blocking an attacker by moving into the attacker’s path to the ball is obstruction. (Blocking off an opponent who has attempted to push the ball past a defender and chase after it, is the simplest and earliest mentioned obstruction offence in the Rules of Hockey). The ENG player then becomes stationary in possession of the ball before moving backwards to make contact with the USA player (a common tactic to locate the exact position of an opponent, often seen in shootouts with a goalkeeper). That was both an obstruction offence and a physical contact offence. The ENG player then shields the ball from the USA player as she moves sideways with it – more obstruction. 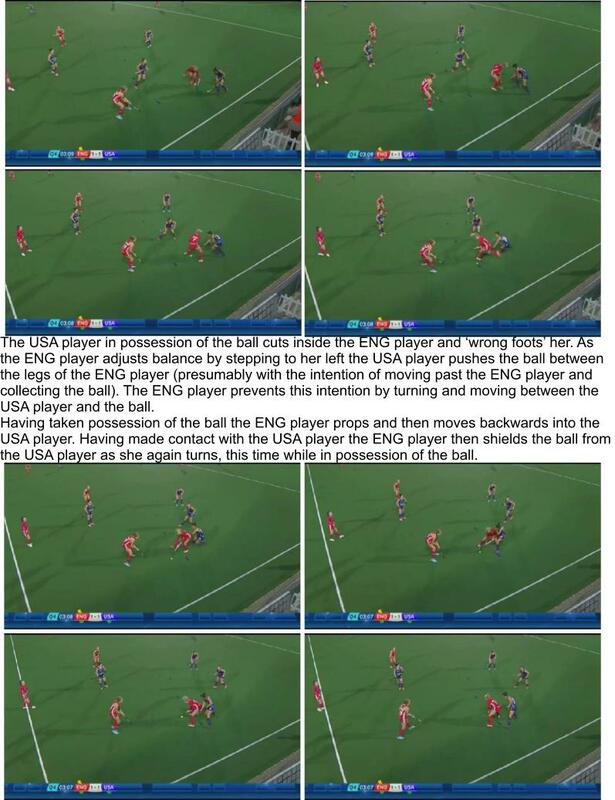 The ENG player then demonstrated that she possessed both the stick-work and footwork to have avoided committing the obstruction offences, as she eluded the final tackle attempt by the USA player and ran away with the ball.